A large, multi-session event is like a 3-ring circus. You work furiously putting the thousands of pieces together before the event. You work long and intense hours carrying out these plans onsite. And then you fold-up your “tent” and move on. However, unlike a circus, events are about more than just entertainment – they are about learning and information exchange. A key question should be asked by event professionals: how can I maximize the learning at my event? Fortunately, advances in conference capture and distribution technology are enabling meeting professionals to extend the reach and the life of their events and to increase the learning exchange to more people. What is event content capture? Conference recording has been around for decades starting in the days that audio-cassettes of the presentations were mass-produced onsite and sold in the foyer. Recent technology advances have made it possible to quickly and relatively inexpensively distribute speaker video, audio and visuals over the web in real-time and on demand afterwards. facilities and the price is dropping. Video streaming encoders are turn-key. Presentation management software has proliferated. 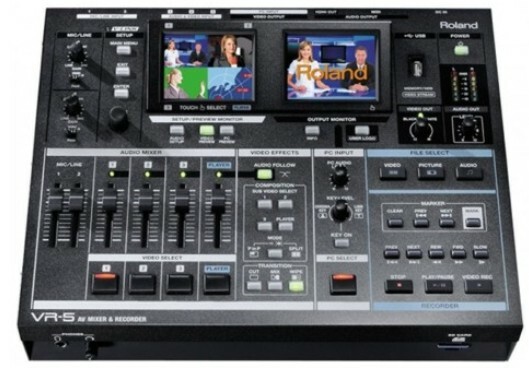 For example, pictured below is the Roland Systems Group (www.rolandsystemsgroup.com) VR-5 incorporating a video switcher, audio mixer, video playback, recorder, preview monitors and output for web streaming. What previously would have required crates of equipment has been shrunk into a 9 pound (4.3kg).box greatly simplifying the production, recording and streaming of live events. With these advances, many companies have emerged to provide content capture and video streaming services for events at reasonable costs. In fact, in some cases, these costs can be offset or eliminated through the resale of the meeting content to a large audience on the web. Large multi-session conferences are great content generators. So much money and effort is made in arranging speakers, meeting space, AV, room set-up, and more. Speakers strive to develop and deliver their content. Content capture and distribution tools allow this content to go beyond just those that are sitting in a specific meeting room. This content generated there can be distributed to a much larger audience in real time and on demand after the event. The ability to deliver content to larger audience through streaming a live event in real time. An ability to deliver content after the event on demand as a refresher for those who attended the session. An opportunity for those who attended the event but could not make it to the specific session to access the content. An opportunity for those unable to attend the meeting to receive the content. An opportunity to add fresh, compelling web-site content throughout the year in build up for next year’s meeting. Corbin Ball, CMP, CSP is an independent 3rd-party analyst focusing on meetings and tradeshow technology. With 20 years of experience running international citywide technology meetings and shows, he now helps clients worldwide use technology to save time and improve productivity He can be contacted at his extensive web site: www.corbinball.com and followed on Twitter:www.twitter.com/corbinball.